Guppy looks ready to make a test of its short-term rising trend line on the 1-hour time frame so I’m thinking of joining the pound bulls right here. Take a look! 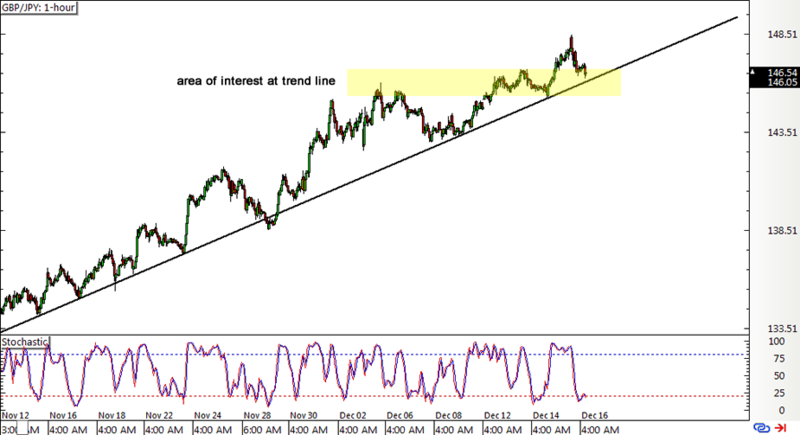 I’ve been watching this trend line for quite some time, waiting for a chance to catch the uptrend on a quick pullback. The correction seems to be taking place right now as the pair is approaching the area of interest at the 146.00 major psychological level, which might keep losses in check. Stochastic is indicating oversold conditions so buyers could regain the upper hand and allow the climb to resume, taking GBP/JPY to the recent highs near 148.50 or higher. Economic data from the U.K. has been mostly stronger than expected this week, with both headline and core CPI beating estimates and posting a faster pace of increase in price levels. The claimant count showed a smaller than expected increase in joblessness of 2.4K versus the 6.2K consensus while the average earnings index rose from an upgraded 2.4% to 2.5%. Retail sales came in line with expectations of a 0.2% gain. In this week’s policy decision, BOE officials voted unanimously to keep interest rates and asset purchases unchanged, citing that they can make adjustments either way depending on how Brexit risks play out. Meanwhile, the BOJ is scheduled to have its monetary policy decision early next week and might reiterate how the depreciating yen is doing wonders for inflation and shed more details on its yield-targeting plans. At the same time, the Fed’s decision to hike interest rates and hint that three more tightening moves are on the table for next year could further dampen demand for the Japanese yen. Analysts predict that USD/JPY could make its way up to 120.00 from here, lifting other yen pairs like Guppy along with it. Long GBP/JPY at 146.25, stop loss at 144.75, profit target at 149.25 for a 2:1 return-on-risk. I’ll be risking 0.5% of my account on this position and I’ll be adjusting my stop to entry once price tests the previous highs.